For your business event, your birthday party, your aperitif or any other festivities we'll prepare you a spectacular buffet, designed entirely as you wish. With us you can book the complete infrastructure, chafing dishes, buffet dishes and -decorations, waiters, tablecloths and napkins, complete asian tableware, water and wine glasses, cutlery . Of course we will cater to your special wishes. Please call 061 333 31 31 for a free offer customized to your wishes. 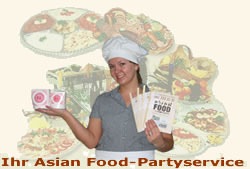 You can also contact us under party@asianfood.ch.